Well, you have got to keep those pesky adventurers from disturbing your ancestors' bones, haven't you? Publisher's blurb: "Go beyond the usual poison darts, collapsing floors, and rolling boulders! #30 Traps for Tombs presents a cruel buffet of maiming, injuring, and outright killing. 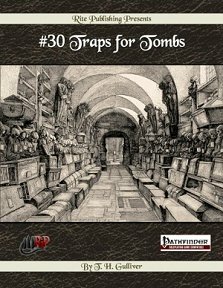 With a selection of vicious deathtraps from CR2 to CR10, set in a detailed burial environment, #30 Traps for Tombs also doubles as a potential bare-bones delve into the long-sealed sepulcher of an exotic necropolis. There are traps within traps, decoys, fire, spears, even monkeys! Everything you need to make for a fun evening in a graveyard is here except for the freshly slaughtered corpses - and your player characters will be happy to bring their own. "Whether you're looking for a catalog of precalculated doom, or just a few bits of mechanical mayhem to spice up a session of questionable forced entry, #30 Traps for Tombs offers up the fun, on a stick!"